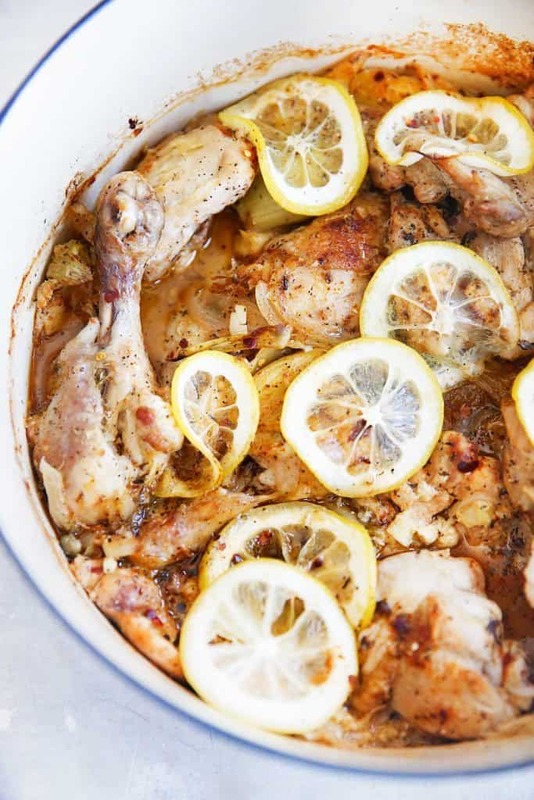 This one-pot Lemon Roasted Lemon Roasted Chicken with Garlic, Capers, and Artichokes is such a flavorful and hearty dish! The perfect dinner for those nights you want as little clean-up as possible! Whole30 compliant, paleo-friendly, nut-free, and egg-free! It’s starting to feel like Winter is on the horizon. Heavier jackets have started coming out, and I woke up to a text of a backyard cover in snow this morning! In lieu, this week’s Savory Sunday is here with a cozy Autumn/Winter meal that is loaded with bright and delicious flavors. 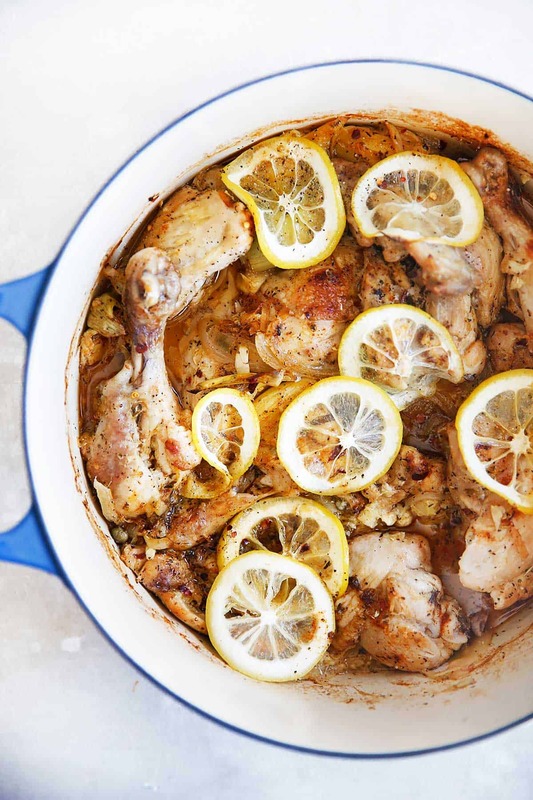 This dish was a major hit; the chicken fell right off the bones and it is extremely simple to throw together, a one pan wonder! Perfect for a Sunday night family dinner, or a meal prep for your work week. In a medium dutch oven, heat oil over high heat. Sauté onions for 2-3 minutes. Pat chicken dry and season well with salt and pepper. In stages, sear chicken on both sides. Should be around 5 minutes each side. In a bowl whisk together lemon juice, lemon slices, artichokes, minced garlic, Italian seasoning, red pepper flakes, paprika, salt and pepper. 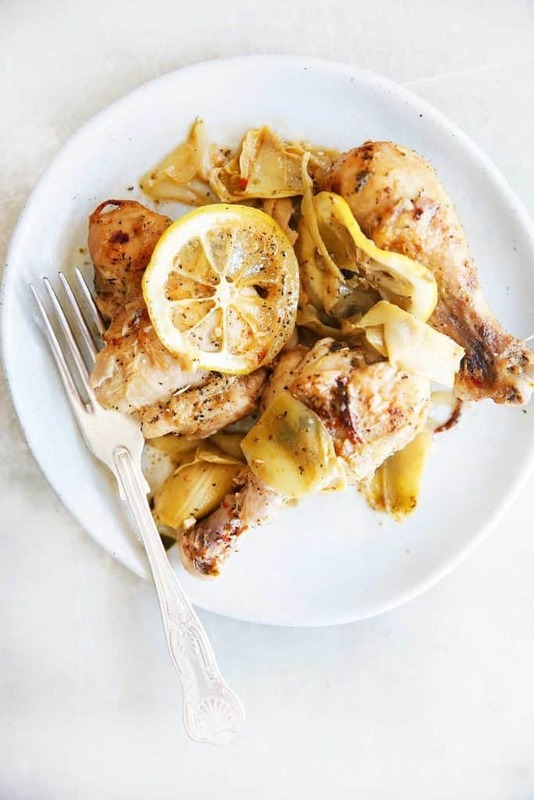 Add the seared chicken back into the pan and pour the lemon juice/artichoke mixture over it. Sprinkle with additional freshly ground pepper, sea salt, and Italian seasoning. Roast, uncovered, in the oven for 30 minutes, or until the chicken is fully cooked and no pink remains. *To make the chicken have extra color, broil on high for 1-2 minutes after roasting. What is your go-to cozy Autumn/Winter meal? Mmmmm. This looks delicious! I’m always looking for new ways to throw artichokes in my diet. Do you think this could be prepped hours ahead of time or even night before? I made this the other night and noticed that you have olive oil listed in the ingredients but in the directions, you never say when to use it. In the ingredients, it says 2 crushed cloves of garlic and 2 whole cloves but the instructions only say when to add the crushed. Can you clarify? I did love the recipe but next time I’ll probably use more artichokes. The flavor was great and the chicken was very juicy! I can’t wait to try more recipes from your site. Step 2: In a medium dutch oven, heat oil over high heat. Hey Lexi, did you keep the roasting rack in the roasting pan while cooking? Are you roasting covered or open ? I made this recipe for dinner tonight and it turned out wonderfully! I had 1 sliced yellow onion and 2 whole garlic cloves leftover. Suppose they get mixed in before going into the oven? Can you clarify? Thanks. Love your site and dry rub wings, especially. I love this recipe! To simplify preparation, I added the onions, capers, garlic and other ingredients to the pan after I seared the chicken, and just mixed it around before putting it in the oven. I will be making it again this weekend for my dad’s birthday dinner!